Enjoy the rapturous feeling of fullness and volume without the weight. Your hair will still feel so manageable and light you’ll be on cloud nine all day! 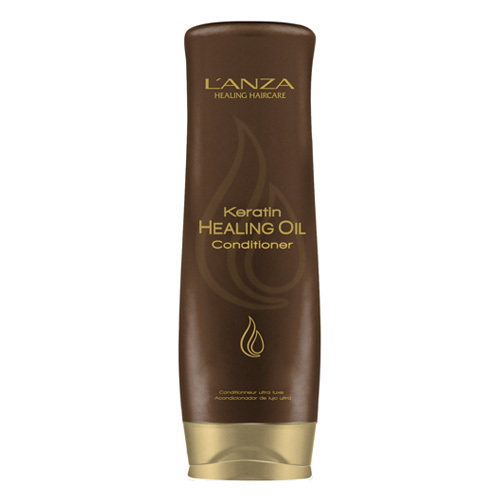 Lanza Keratin Healing Oil Conditioner improves strength and elasticity in dry and damaged hair whilst leaving all hair types healthy and shiny. Go beyond luxury with this technologically advanced conditioner. Infused with an über-luxurious blend of ingredients with super concentrated healing actives, Keratin Healing Oil Conditioner delivers extraordinary results that are immediately visible, touchable and noticeable. Keratin Healing Oil Conditioner is enriched with Lanza’s exclusive Phyto IV Complex, a blend of Abyssinian Flower, Coffee Seed, Acai Fruit and Babassu Kernel Oils which work in synergy to replenish the hair’s natural levels of Keratin Protein, essential Fatty Acids, Emollients and nutrients. Offering triple UV protection, Keratin Healing Oil Conditioner heals and protects hair colour and builds body and volume in the hair without weighing the hair down. Free from Gluten and Parabens, Keratin Healing Oil Conditioner leaves the hair healthy, shiny and radiant. An ideal daily hydrator and detangler for color-treated hair. Quinoa Color Repair complex harnesses the high protein content of quinoa to lock in hair color and repair strands from within. Shea butter, jojoba and soybean oil leave hair soft, shiny and healthy, while vitamins nourish and moisturize. Powerful antioxidants provide UV protection to help prevent color fade and damage.